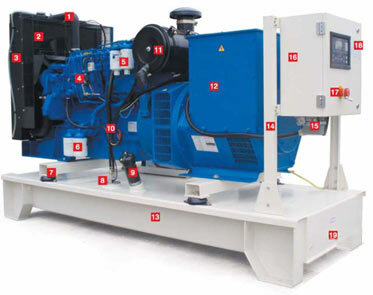 The generator Set is the combination of an electrical generator and engine (prime mover) mounted together to form a single piece of equipment. This combination is also called an engine-generator set or a gen-set. In many contexts, the engine is taken for granted and the combined unit is simply called a generator. In addition to the engine and generator, engine-generators generally include a fuel tank, and engine speed regulator and a generator voltage regulator, cooling and exhaust systemn, and lubrication system, Units larger, than about 1 kW rating have a battery and electric starter; very large units may start with compressed air. Standby power generating units often include an automatic starting system and a transfer switch to disconnect the load from the utility power source and connect it to the generator. Engine-generators are used to supply electrical power in places where utility (central station) power is not available, or hwere power is needed only temporarily. Small generators are sometimes used to supply power tools at construction sites. Trailer-mounted generators supply power for temporary installations of lighting, sound amplifications system, amusement rides, etc. Privately-owned generators a re especially popular in countries where grid power. Normally products can easily customize generating sets to met the customer's individual needs but the following components are standard on all our machines.